Common Name: Eriobotrya leaf, Loquat leaf. Part Used & Method for Pharmaceutical Preparations: The leaves are gathered in late spring or early summer and dried in the sun. Then the down of the leaves is brushed off and the leaves are cut into pieces. Functions: 1. To resolve phlegm and stop cough; 2. To conduct rebellious qi downward and stop vomiting. 1. Heat in the lungs manifested as cough and asthma. Loquat leaf (Pipaye) is used with Mulberry bark (Sangbaipi), Swallowwort rhizome (Baiqian) and Platycodon root (Jiegeng). 2. Heat in the stomach manifested as nausea and vomiting. 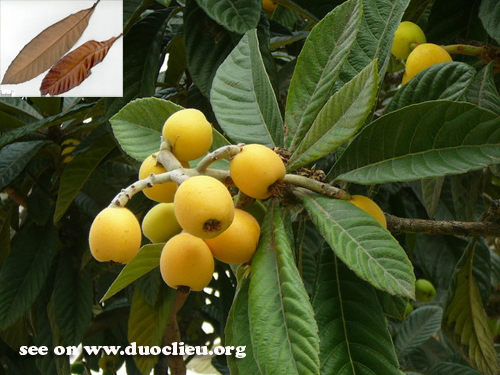 Loquat leaf (Pipaye) is used with Bamboo shavings (Zhuru) and Reed root (Lugen). 3. For dry mouth and for vomiting due to Stomach Heat, it is used with Radix Ophiopogonis (Mai Dong), Caulis Bambusae In Taeniis (Zhu Ru), and Rhizoma Phragmitis (Lu Gen).